"It was about eight o'clock at night, and dark, and raining, and freezing, and the wind was noisy the way it is in spooky movies on the night the old slob with the will gets murdered. I stood by the cannon on the top of Thomsen Hill, freezing to death, watching the big south windows of the gym - shining big and bright and dumb, like the windows of a gymnasium, and nothing else (but maybe you never went to a boarding school). "I just had on my reversible and no gloves. Somebody had swiped my camel's hair the week before, and my gloves were in the pocket. Boy, I was cold. Only a crazy guy would have stood there. That's me. Crazy. No kidding, I have a screw loose. But I had to stand there to feel the goodby to the youngness of the place, as though I were an old man. The whole school was down below in the gym for the basketball game with the Saxon Charter slobs, and I was standing there to feel the goodbye. "I stood there - boy, I was freezing to death - and I kept saying goodbye to myself, 'Good-bye, Caulfield. Good-bye, you slob.'" So begins I'm Crazy, a short story by J.D. Salinger featuring Holden Caulfield, a teenager on the cusp of college and the standard life-trajectory but with an inchoate yearning for something different. 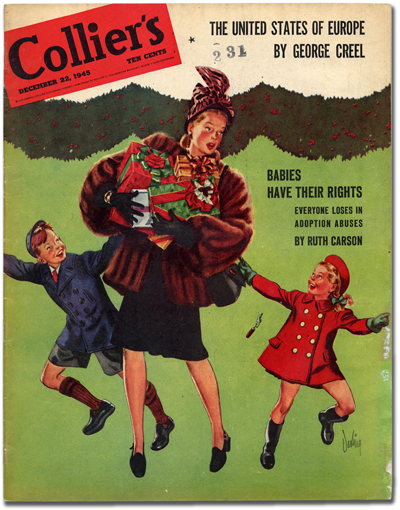 It was published in the December 22, 1945 issue of Collier's magazine. "I started running with my suitcases banging the devil out of my legs. I ran all the way to the Gate, stopped, got my breath, and ran across Route 202." Having flunked-out of his third school for not applying himself, Caulfield, unfocused, listless, and alienated, now faces a grim future, consigned by his father to work in an office. Life is over before it has begun. But life for Holden Caulfield as a literary character was just beginning. The disaffected and disenchanted youth of the story, fully developed in The Catcher in the Rye (1951), became the figurehead for all adolescents in the post-WWII U.S., spawning the youth movement that emerged in the post-WWII years to question the status quo and the automatic assumption that after school one settles down and gets a job, no matter how soul-sucking it may be; to work in an office is to be prematurely buried. Holden Caulfield was the first adolescent anti-hero and became an icon of teenage angst and rebellion. I'm Crazy forms the basis for the first two chapters of The Catcher in the Rye, including the scene with Mr. Spencer, Holden's kind but unsympathetic teacher. Here, Holden is a more repentant figure, lamenting his failure. He has another sister, Viola, who didn't make it into Catcher... In the accompanying illustration, Holden wears a standard fedora rather than his typical red hunting cap. I'm Crazy was not Salinger's first story to feature Holden Caulfield. The character was introduced in A Slight Rebellion Off Madison, which, though appearing in The New Yorker a year after I'm Crazy appeared in Collier's, was actually written by Salinger and accepted for publication in 1941 - ten years before The Catcher in the Rye appeared - under the title Am I Banging My Head Against the Wall? but held back from publication until after the war. 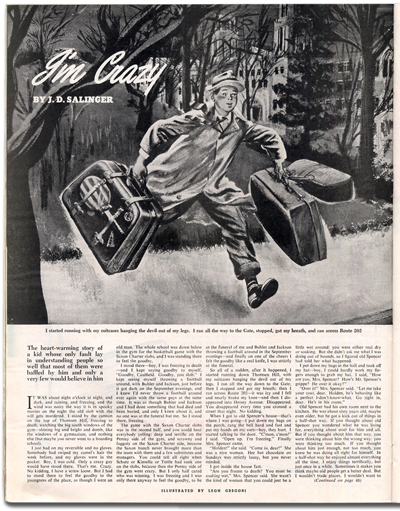 Salinger was highly protective of his work and never allowed many of his early stories, including I'm Crazy, to be reprinted, so uncollected magazine appearances are highly desirable to Salinger enthusiasts. And, too, as a result of illustrations like the one accompanying this story, Salinger later forbid their use; he didn't want the reader to be influenced by an interceding illustrator's interpretation of his work. “If you really want to hear about it, the first thing you’ll probably want to know is where I was born and what my lousy childhood was like, and how my parents were occupied and all before they had me, and all that David Copperfield kind of crap, but I don’t feel like going into it, if you want to know the truth." It's as if Salinger somehow heard Tuddy Cicero, in Scorsese's Goodfellas, complain about adolescent Henry Hill helping a stranger who's been shot and took heed: "We gotta toughen this kid up." Holden gets an edge - however mild by today's standards - yet remains vulnerable. We're also witnessing Salinger's development as a writer with perfect-pitch for real-world, non-literary dialogue. This attractive issue of Collier's is being offered within First Books and Before, a new catalog from Between the Covers that considers the question Where does an author's career begin? by featuring first books and early appearances, many of which are quite affordable. Images courtesy of Between the Covers, with our thanks. I have offered this magazine on ebay at a significantly lower price than is currently being asked online.